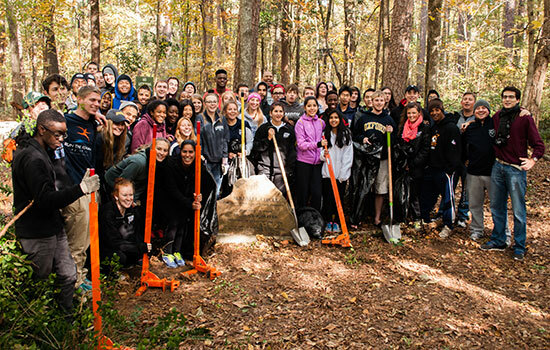 At Oxford’s Athletics/Forest Restoration Team/Sustainability Office Emory Cares service project, 65 athletes from all teams participated, plus three student members on the Forest Restoration Team. From filling soup bowls for the hungry to tending a beloved historic garden, Emory alumni and friends unite each November to give back to their communities in service projects in honor of Emory Cares International Service Day. Participating in California and Atlanta projects simultaneously, Zachary Cole 18C, his parents Gary and Cari, and his sister Madison, texted about their respective projects all day. “It was a great way for them to feel connected from 2500 miles away,” says Ariane O’Dea, associate director of alumni relations at the Emory Alumni Association. View the photo galleries here. Editor’s Note: Emory Cares International Service Day has become a global phenomenon that occurs the second Saturday of November in cooperation and partnership with Volunteer Emory. Stay tuned to EmoryWire for registration details for Emory’s 2015 projects.